The phrase file import refers to the act of taking a non-native DBT file and bringing it into DBT for editing and producing braille. There are many different file types that DBT can import. Of these, the most common is Microsoft Word. If you want to import files into DBT for languages other than English, there are few alternatives beyond Microsoft Word and Open Office files. This topic is organized so that all the information about languages other than English is at the end. The picture above is the File, Open dialogue. The pull-down menu near the bottom that shows All Files (*. *) allows you to select different file types. The first line of this pull-down menu says DBT Files (*.dxp, *.dxb). DBTopens your Duxbury print files (*.dxp) and your Duxbury braille files (*.dxb). Since this is a discussion about importing files from non-DBT sources, it skips any discussion of opening existing DBT files. Note: This section deals with files written in the English language. Duxbury DBT has supported Word 97/Word 2003 files for a very long time. DBT now supports importing Microsoft Word 2007/2010/2013/2016 files. Open Office is an open source alternative to using Microsoft Office. Open Office uses a similar file format to Word 2007/2010/2013/2016. If you have Duxbury DBT 11.1 or newer, you can also import Open Office files. 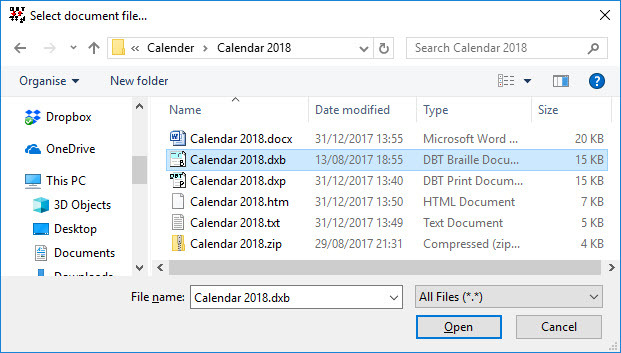 For those preparing files for use in the United States, a template for MS Word comes with DBT to ease the work of braille production. Click here for details on the latest BANA Template. MathType is a relatively low-cost program which, among its many capabilities, enables mathematical equations to be inserted into Microsoft Word documents. It is produced by Wiris. Word documents containing MathType equations can be opened in DBT, and translated into mathematical braille. See below about Scientific Notebook, another popular program for producing math equations for use with DBT. DBT does not import MS Word RTF files. However, many third party programs produce RTF files but call them Word Documents. Some copies of Acrobat offer to export to Word files. Some OCR software offers to produce Word documents. In both cases, the result may actually be an RTF file. See below on how to convert RTF files into true Word files. If you do attempt to import an RTF format file into DBT, DBT posts an error message, identifying that this is an RTF file. While WordPerfect is not a leading product anymore, it was once the premier word processor. DBT retains the ability to import files from WordPerfect 3.X, 5.X, or 6.X. DAISY files (Digital Accessible Information SYstem) are XML files designed for access by the disabled. While useful for braille production, DAISY files often lack all of the encoding needed for quality braille. While DBT can import these files, some of them are extremely large, making direct import difficult. NIMAS files are specialized DAISY files that meet national instructional materials standards. These files are often massive, and they can require careful treatment to prepare them for braille. Duxbury Systems has created a program called NimPro, which greatly facilitates the import of NIMAS files to DBT. Please, click here for more information. Getting quality braille files from MegaDots to Duxbury DBT has become quite easy. MegaDots 2.5 can export a file from MegaDots into the MegaDots export file type MS Word/BANA Template. This file can be imported into DBT using the DBT template English - American - BANA. Just about all the subtle formatting placed in the MegaDots file is carried over into the DBT file, so it is worthwhile to follow the recipe exactly. DBT imports many different standard text (.txt) files. Modern text files mostly use the "Unicode" character set, but older files may use one of many "Code Pages" to represent their text. If you find yourself facing unreadable text, selecting the correct Code Page may help. See DBT Code Pages for Text Files. Scientific Notebook, is software which produces LaTeX files. LaTeX files can be imported into DBT both for the text and the mathematical equations. (See above about MathType, another popular program for producing math equations for use with DBT). Duxbury Systems supports Scientific Notebook 5.5, which is still available as a download. The new version, Scientific Notebook 6.0, is not compatible with DBT at this time. DBT has the ability to import simple HTML files from the web. If the direct file import is not successful, import the HTML file into Microsoft Word, then export (Save As) as a native Word file. NOTE: Word offers as a default choice to export the file back into a Web Page. You need to deliberately select Word file as the file type to import this file into DBT. To import an RTF file into DBT, first import the file into Microsoft Word, then export (Save As) as a native Word file. NOTE: Word offers as a default choice to export the file back into a Rich Text Format (RTF) File. You need to deliberately select Word file as a file type. Then you can import this (actual) Word format file into DBT. Braille Formatted Files have many nuances. Click here for a detailed discussion on importing braille formatted files. DBT supports Unicode fonts. Microsoft Word works with both Unicode and non-Unicode fonts. In the past, languages like Lao, Tibetan, or Oriya were impossible to support without specialized add-ons to Microsoft Word. It is now possible to buy a computer, obtain a word processor (Open Office or Microsoft Word), and immediately set to work writing in many alternate script languages without first having to obtain a special font. As an added bonus, this means that screen readers and other accessibility software have more opportunity to handle your language. At this point, DBT imports or handles about 75 ranges of Unicode characters. For some nations, their isolation from mainstream computer users and the cost barriers to better solutions caused widespread use of non-Unicode fonts. Thus to offer a braille translator that is practical, Duxbury Systems had to support the dominant font system in use. We have some support for the Akadem font for Cyrillic text, the Saysettha font for Lao text, and the SutonnyMJ font used in Bangladesh for Bengali text. This work is exacting and quite complex, so Duxbury supports non-Unicode fonts only when there are no other alternatives. In the Global Settings, Word Import Menu, you can set the choice of how Chinese characters are imported. Both Arabic and Hebrew inkprint are written from right to left. Arabic and Hebrew braille are written from left to right. While DBT displays all inkprint text from right to left, do not attempt to edit the text in DBT. Instead, clipboard the entire line into Word, edit it in Word, and then paste the whole line back into DBT. See also the note below about Script and Font Issues. Hangul script composes 2 or 3 characters into a single symbol. When DBT imports a file, the process is reversed. DBT breaks down a single Hangul character into its component parts. In technical terms, all Hangul characters from U+AC00 through U+D7AF are redirected into Hangul Jamo characters U+11xx. The result can be difficult to read for those who are used to reading the conventional inkprint. For these languages, it is best to do all the editing in Microsoft Word, then to import into DBT and use DBT as the translation engine and for output. Many scripts (Mandarin, Cantonese, Ethiopic, Khmer, Lao, Oriya, Sinhala, and Tibetan) are best viewed on a Vista, Windows 7, Windows 8, or Windows 10 machine. Myanmar (Burmese) script support requires Windows 8 or Windows 10.